Brigadier General Baha' Nouri al-Azzawi. There's an eerie silence as Brigadier General Baha' Nouri al-Azzawi leads his six-truck convoy of armored vehicles through the narrow unpaved side-streets of a former insurgent stronghold on the western fringes of Baghdad  even the capital's ubiquitous din of power generators is absent. "These streets, we used to call them death streets, because they would kill somebody and put the bodies here," the Iraqi police commander says. "Now everything is calm and quiet." Perhaps a little too quiet. Hay al-Furat, along with other neighborhoods along the once-perilous road leading to Baghdad's airport, had been one of the capital's many sectarian fault-lines. The north of the district was controlled by Shi'ite strongman Moqtada al Sadr's Mahdi Army, while the south was in the hands of extremist Sunnis of al-Qaeda. But the shifting lines of demarcation trapped residents in the ferocious bloodletting and prompted some 5,000 families to flee, joining the estimated 4.8 million Iraqis  almost one fifth of the population  that has been displaced by the war. Of this total, some 2.7 million remain inside the country, while the balance fled abroad, mainly to neighboring countries. Still, one Iraqi's hell can be another's haven, and as sectarian warfare split Hay al-Furat's once-mixed community into separate Sunni and Shi'ite enclaves, Iraqis displaced from other parts of the city sought shelter in its militia-protected homogenous zones. Now that the sectarian killings seem to have abated, the government is keen to re-establish mixed neighborhoods. 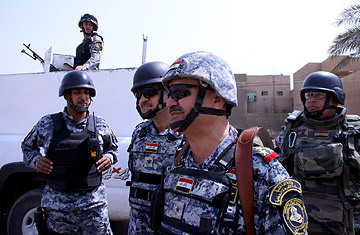 The Iraqi police have begun a campaign to evict squatters from homes abandoned by their owners. The government is offering cash incentives to both squatters and displaced homeowners alike, and has earmarked $195 million for the resettlement campaign. Azzawi hasn't yet had to forcibly evict anyone in the area under his control, even as some 2,760 families have returned in the past few months. His office receives about 20 complaints a week from displaced homeowners wanting to evict those who have taken over their homes, the general explains, but most squatters leave after an initial warning. The mustachioed police commander (who drives himself in the lead car) turns into a dusty alleyway riddled with potholes, where most of the low-rise beige homes hidden behind high walls remain empty. Many are littered with the debris of half-collapsed walls, while others are burnt wrecks. Grade-school math equations scribbled in chalk on the green metal gate of one home are a stark reminder that children once lived here. Azzawi's men have been in this street before, checking the homes for IEDS and other unexploded ordnance. Many of these homes had been insurgent safe houses, he says, adding that his men regularly uncover arms caches in the zone. Once a house has been cleared of any potential threats the word "empty" is spray-painted on its gate. The general stops his truck abruptly. A young man in his 20s is hurriedly loading furniture into a pick-up truck in the otherwise empty street. "The owner of the house wants the house back so we're leaving," says the young man, Ammar Abdel-Karim. His family of six moved into the drab home eight months ago from Hay al-Risalah, a once-mixed district further south that fell under the Mahdi army's control. "The security situation wasn't good," he says, shuffling. "We were threatened." "The Mahdi army killed two of my sons," his chador-clad elderly mother wails from beside a rusty white gate. The general assures the family that it's safe to return to their old neighborhood, and tells one of his men to help the family load its belongings. "They are Sunnis and they came here thinking they'd be safe," Azzawi says. Although many Iraqis are slowly returning to their homes, fear and sectarian distrust linger. Some people, like Awataf Mahmoud Taher and her four teenage daughters, are returning to homes where loved ones or neighbors were killed. Although improved security is encouraging some people to return, others are forced to do so by financial or legal difficulties. A friendly woman in an embroidered black abaya and plain black headscarf, Taher fled her leafy two-story home in the predominantly Sunni district of As-Sayidieh after her 65-year-old husband was shot in the head at point-blank range as he cowered in the kitchen. She has no doubt why he was killed. "Because he was Shi'ite," she says as Azzawi listens silently. "I'm still scared of this," she whispers. Ali al Amari, the head of As-Sayidieh's local council, acknowledges the distrust that many people still feel. He too, fled this former al-Qaeda stronghold. When he returned several months ago, the 26 members of the local council, 13 Sunnis and 13 Shi'ites walked hand in hand through the town's streets in a show of unity. The lanky councilman checks in on Taher daily, as well as on the other families that have trickled back to his neighborhood. "We haven't forgiven, but we have reconciled, not with the killers, the terrorists, but with our neighbors," he says. "There was a time when Sunnis would seek protection from al-Qaeda and Shi'ites from the Mahdi army, but when we discovered that they were all just criminals, we all turned on them." Azzawi nods his head in agreement. He congratulates Taher on her homecoming and gets back into his armored vehicle to continue his patrol. He understands the difficulties of displacement. His wife and three teenage children fled to Syria months ago, he later wistfully confides, because of increasing threats against him by both Sunni and Shi'ite insurgents. But he says they will return. "It's my Iraq, my country. We should return to it. No matter where we are, we will one day come home."